All sets start with coach(in black) passing to player on top cone(in red). 1: Recieve and turn right, do a through gate and dribble through goal. 2: Recieve and dribble forward, do move through gate/beat a defender, dribble through goal. 3: Start on the side, run to the the top cone, recieve and turn away from pressure - do move through gate to beat a defender, dribble through goal. 4: Recieve and turn left, do two quick turns through both gates that make a triangle, accelerate out of 2nd move and dribble through goal. 5: Recieve and do variety of sensitivity touches(Irish Dancing forwards and backwards, Foundations, inside/outside) through gate, then dribble through goal. After dribbling through any gate, player should accelerate to the goal. 1: Quickly review moves to get away from pressure and moves to beat an opponent. 3-5 minutes. 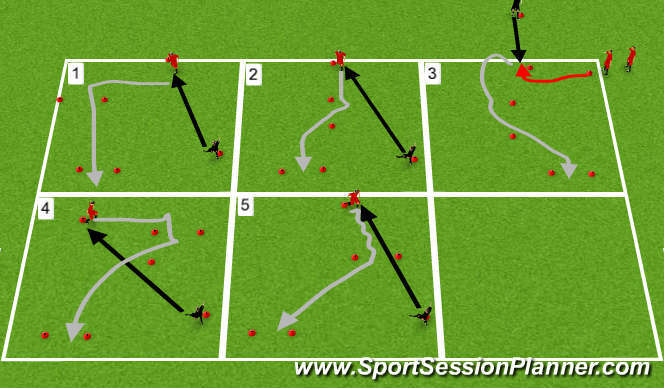 3: Take away 2-3 balls from the whole group. A player without a ball is defender. Same score-counting as progression B, but now defenders can steal the ball and become an attacker, player they stole from has to steal a new ball. Players are forced to recognize pressure(defender) and dribble away while still trying to score. 5-7 minutes.